When we first heard the news earlier this week that John Duthie would no longer be a member of Team PokerStars Pro, we wondered aloud what implications this might have for his relationship with the PokerStars controlled European Poker Tour (EPT) where Duthie –the founder of the EPT—still acted as the CEO. On Wednesday we found out, as Duthie announced he would be resigning from his CEO position. 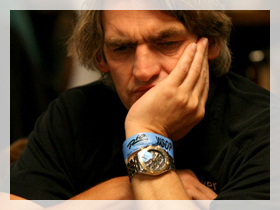 Once again the news came via the 2+2 Poker Forums (where Duthie explained his decision to leave Team PokerStars Pro just days before) and it seems that the man who took a fledgling poker tour and turned it into one of the most prestigious and recognizable brands in the poker world is not simply going to sit idly by counting his money. The decision to leave the EPT was similar to Duthie’s decision to not renew (or try to renew) his Team PokerStars Pro contract in that both contracts apparently expired on December 31, 2011. I’ll posit a little speculation here and assume that Mr. Duthie already has another gig lined-up at this point. The new CEO, Edgar Stuchly, was promoted from within, having been named EPT President in August 2011. Stuchly is a former Poker Staff Person of the Year according to PokerNews.com, and has over a decade’s worth of experience running card-rooms in Austria. This entry was posted on Thursday, January 5th, 2012 at 9:38 am and is filed under Poker News. You can follow any responses to this entry through the RSS 2.0 feed. You can leave a response, or trackback from your own site.